The diadem sifaka has a beautiful coat of three colors: white, black, and orange. Despite the low light in the Andasibe rainforest, I couldn’t resist taking photo after photo of this sifaka’s family group this morning. Warning: Watching sifakas for an hour can leave you with a serious crick in your neck. 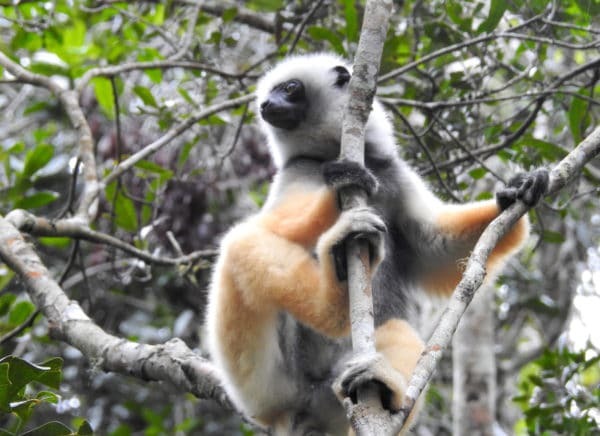 What’s the difference between a lemur and a sifaka? A sifaka is a type of lemur that jumps vertically using its back legs. Most other lemurs use all four of their legs for leverage when jumping, and they also walk on all fours like cats. Sifakas don’t walk at all. They either leap or climb to get around.